Valley Wetlands RSPB Reserve, which is situated right beside RAF Valley, presents opportunities to see all kinds of birds - not just the feathered variety. The other more noisy kind include Hawk Trainer jets and Search and Rescue Helicopters. Despite this occasional distraction, however, this wetland reserve is a lovely and surprisingly peaceful place for a stroll, with lots of wildlife interest including plants and insects as well as well as plenty of birdlife, of course. On Anglesey, take the A55 dual carriageway from Bangor to Holyhead and come off at the junction which is signed Bodedern and Caergeiliog. 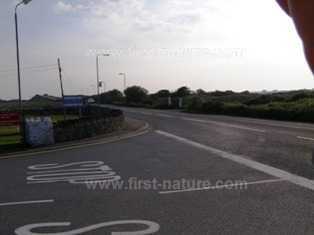 At the roundabout turn left and follow signs to RAF Valley. Continue along this road until you see a lake (Lake Penrhyn) on the right hand side. At the end of the lake there is an entrance to the reserve car park, with white posts and an RSPB logo. There are well defined footpaths and some good viewing points, but this reserve is not suitable for wheelchair users or for prams and pushchairs; it can get quite marshy on some sections of paths after prolonged rain. There are information boards at the site. Shops, pubs, toilets and cafés can be found in many of the nearby villages. Valley Wetlands always has something interesting for you to see no matter what time of the year you visit. The winter is a good time to see Goldeneyes (Bucephala clangula) and Widgeon (Anas penelope), and in summer the reedbeds come alive with Reed Warblers (Acrocephalus scirpaceus) and Sedge Warblers (Acrocephalus schoenobaenus). Birds that breed at Valley Wetlands during the summer include Tufted Ducks (Aythya fuligula), Pochards (Aythya ferina), Shovelers (Anas clypeata), Gadwalls (Anas strepera) and Little Grebes (Tachybaptus ruficollis). As with many wetlands there is always a chance of seeing a Marsh Harrier, and other special birds to look out for in the reedbeds include Water Rails (Rallus aquaticus) and Cetti's Warblers (Cettia cetti). For those interested in plants, this reserve is home to some unusual species including Eight-stamened Waterwort (Elatine hydropiper), Flowering Rush (Butomus umbellatus), Hop Sedge (Carex lupulina) and Marsh Fern (Thelypteris palustris). Flowering Rush is becoming increasingly rare in the wild in Britain, and some of the nature reserves in Wales represent real strongholds for this beautiful plant. 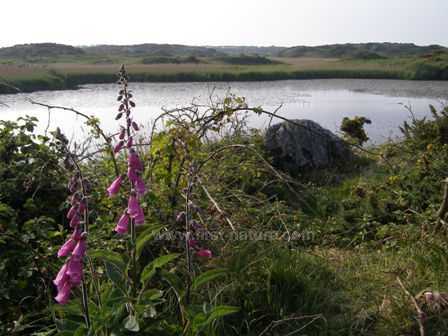 If you are fond of wild orchids this is a good place to see the beautiful dark-purple Northern Marsh-orchid (Dactylorhiza purpurella) and Early Marsh-orchids (Dactylorhiza incarnata). Early Marsh-orchids appear in various colours from deep pink to a lovely salmon pink, and occasionally specimens with pure-white flowers can be found. In the early summer there are marvellous stands of Yellow Iris (Iris pseudacorus) among the reeds at the edge of the lake. 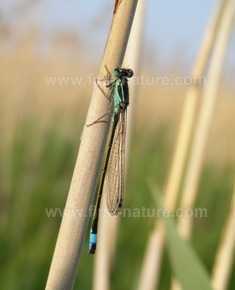 These same reeds provide convenient resting places for the many Damselflies (including the Variable Damselfly, Coenagrion pulchellum) and Dragonflies (including the Hairy Dragonfly, Brachytron pratense, which is Britain's smallest hawker) which, along with a great diversity of other insects, can be seen on this reserve. Otters (Lutra lutra) also live in the reserve, but these shy creatures are seldom seen. You may be more lucky with the Water Voles (Arvicola terrestris) which sometimes swim along the edges of the reeds in the lake. Early mornings and evenings are the best times to visit Valley Wetlands during the summer months. Our most recent visit was on a beautiful June evening when the whole reserve was alive with birdsong and the buzzing of insects. 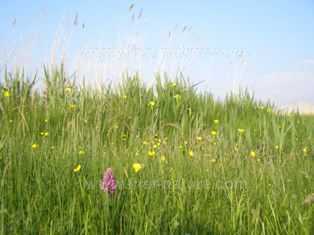 At that time the orchids were flowering in the grass beside the reeds and along the paths throughout the reserve. Altogether, it was a most enjoyable visit to a delightful place.